Our organization is counted among the most trusted business entities involved in offering optimum quality range of Spring Testing Machine. The cabinet contains the hydraulic unit the hand wheel of the pump and the release valve handle are outside the cabinet for easy operation. 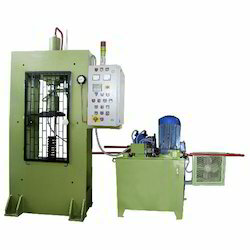 Used for the purpose of testing various springs, the offered Spring Testing Machine is one of the best options available. Manufactured as per the set industrial norms and guidelines, its quality never deteriorates. For the purpose of providing the best, quality raw materials and modern machines are applied in its making. Our organization offering our clients with Pendulum Impact Testing Machines that works on pendulum principle and are highly suitable for conducting Charpy & Izod Impact tests on various material. Minimum energy absorption is assured due to rigid designs of machine frame & other parts during fracture that results in improved test accuracies. Highly stressed parts such as support blocks & strikers are manufactured using special alloy steels that are duly heat-treated. Owing to our expertise in this domain, we are affianced in offering a wide assortment of Digital Spring Testing Machine. Designed with micro-controller based indicators, provided machine measures the load and deflection of various kinds of springs. In order to manufacture this testing machine in line with international quality standards, our adroit professionals use quality-approved components and modern methodology. 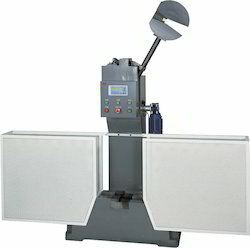 We offer this Digital Spring Testing Machine in various technical specifications within budgeted costs to the clients.